Warning: Big spoilers for the end of Shazam! below. 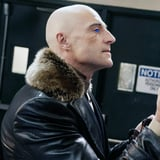 After having lost a battle with Billy Batson's Shazam (played as an adult by Zachary Levi), Sivana is locked away in a prison somewhere. We see him, sapped of the powers the now-defeated Seven Deadly Sins imbued him with, frantically scribbling a sequence of magic symbols on the walls of his cell in hopes that he'll be able to open a portal to the wizard's lair like he does earlier on in the film. It doesn't work, but he soon realizes that he might have a Plan B in the form of Mister Mind. At the beginning of Shazam!, the Wizard Shazam (Djimon Hounsou) magically transports a young Sivana to his otherworldly lair, where the camera zooms in on a caterpillar-like creature in a glass jar. The same jar is shown again when Billy Batson is called to the cave, only it's empty - clearly the bug escaped. As we discover later, the devious Venusian worm from the comics was the creature in the jar all along. He's able to wriggle into Sivana's cell through an air duct and tells him that they need to work together, declaring that "the Seven Realms are gonna be ours!" So, Who Is Mister Mind? In case you're wondering, Mister Mind has actually been a longtime foe of Shazam in the comics. Depending on which iteration of the story you're reading - whether introduced by Jerry Ordway in his Power of Shazam! series or in Fawcett publications and pre-1985 DC Comics publications - he's usually seen as a cartoonish worm from the planet Venus who has a genius-level intellect, mental image projection, and limited telepathic powers. He's also able to spin a form of nearly indestructible silk at unbelievably high speeds, and speaks through a "talk box" that hangs around his neck. He goes on to form a team of supervillains called the Monster Society of Evil, which includes everyone from Jeepers and Mr. Banjo to Benito Mussolini (yes, really). He also has a pretty insane laugh, if that matters to you. Does Mister Mind Have a History With Dr. Sivana or What? In one comic storyline, Mister Mind is able to travel to Earth by stowing away on board a space probe and soon comes in contact with Doctor Sivana. (It's actually Sivana that dubs the worm "Mister Mind," in this version.) Together they plan a full-on worm invasion on earth, and Mister Mind takes over the body of wealthy businessman Sinclair Batson to carry out some of his plans. Their plans are foiled by Captain Marvel (aka Shazam), but Mister Mind escapes by taking control of Department of Metahuman Affairs Director Sarge Steel and later gets revenge by destroying Marvel's hometown of Fairfield. What Does Mister Mind Have to Do With the Seven Realms? And Actually . . . What Even Are the Seven Realms? The "Seven Realms" that he mentions in the midcredits scene are also a concept from the comics, but they've only recently been introduced. Apparently there are multiple magical realms throughout Shazam's reality, but not all of them have been revealed so far. Billy is seemingly the protector of earth, and it would make sense that the remaining seats on the ancient wizard's council would be occupied by six other Champions who protect and safeguard the other realms. Unfortunately that's all we really have to go on at the moment.